In graphite by C19 hand at top centre (bottom centre in correct orientation), Blenheim / Basement story; and in brown ink in C19 hand at top right (i.e. bottom left), 63. The verso of this sheet forms the backing for 109/61, a separate sheet that covers about two thirds of the area of this sheet. An inscription and part of the drawing work of 109/61 is on the verso of this sheet rather than on the pasted-on sheet. This basement corresponds to one in the Bodleian (MS Top. Oxon.a). Although the plan is of the main pile only, it is unlikely to have been prepared after the designs of the east and west service courtyards were worked out. Alterations to the positions of chimney breasts in the walls of the east wing in the main floor plan, 109/59, imply changes at this level as well. Both levels are thus datable before the start of work. 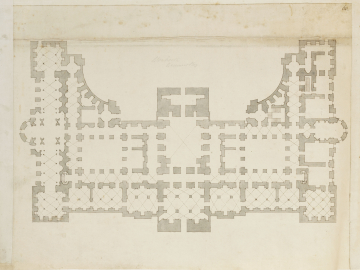 It is noteworthy that the several elements of the Blenheim ground and basement plans are worked into the planning of the oval court scheme (109/64), in particular the corridors with niche recesses, the apse-ended rooms, the square angle bastions with circular rooms and tunnel-like window recesses, and of course the concept of a quadrant-shaped courtyard flanking a portico with giant-order columns.